In this excerpt from their new book From Bud to Boss: Secrets to a Successful Transition to Remarkable Leadership, authors Kevin Eikenberry and Guy Harris asks us to analyze our own emotions and ideas on change and walk us through what change feels like, especially for new leaders. As a way to get started on the topic of change, let’s do an exercise. First write down three situations in which you have experienced change. These can be organizational or personal; recent or distant in the past; big or small. While your transition to leadership may be an obvious one to think about, you can pick anything. There are no wrong answers. Write them down here as you think about them. Next, write down a list of words or phrases that you think about when you think about these particular events. Write down whatever comes to your mind. Do this quickly–the goal is to get something down, not to create the perfect or exhaustive list. Again, there are no wrong answers. 1. You have emotional words on your list. Not everything we think about in a change situation is logical and fact based. You are likely to have words such as painful, fear, scared, and exciting on your list. 2. You have a mixed list of words. Although some of the words on your list may be neutral, most likely some of your words are positive in your mind while others are not so. And chances are you have more than a couple of positive, and more than a couple of negative. Even if we missed our guess and one of these statements isn’t true for you, rest assured they are for most people. And since in your new role how others experience change is as important as how you experience it, let’s talk about the implications of this brief personal exercise. Your relationship to how others view and act in regard to change probably isn’t something you needed to think much about in the past, except perhaps in a family setting. This shift in perspective is a critical area of leadership. So let’s look at two important concepts to understand about how people respond to change. First, let’s think about your experience. Again, we are confident that at least some (if not a majority) of your words were about emotions. “When I got promoted, I felt like I lost the friendships of my peers.” The loss may or may not be factually so, but the feeling of loss can have an impact on our thinking and actions. “When I got promoted, I was scared–I wasn’t sure what was next.” Change events may be fact based, but our response is often about our emotions. If we are scared or anxious, it will change how and what we think and do. “When I got promoted, I was excited! I have been looking forward to a new challenge. I don’t know exactly what it all means, but I am excited.” There really isn’t a question that excitement will affect our behavior and thinking. Is there? So our emotions in a change situation are real. And they are real for everyone else, too. We are also sure that your list had some words that you consider positive, some negative (and perhaps some neutral). This is natural. Not everything about change is great–or awful. This variation in emotion is why people will sometimes seem like a Jekyll and Hyde when it comes to a change–sometimes reluctant and other times ready to go. Perhaps an even more important point: what we think and how we feel about change (and therefore how we will behave in the face of it) depends both on the context and our recent personal experiences with change. Context matters. Some people are more comfortable with changes in certain situations (like at work)–even if they are less so in other situations (like at home). The opposite is also true. If someone has recently gone through, or is in the midst of, a difficult change situation in one part of his or her life, that person will be more cautious and hesitant with other changes at the same time or soon after. Alternatively, people who are feeling good about things that are changing in their lives will generally look more favorably on other changes at that same time and soon thereafter. All of what we have just described is true for everyone. But not everyone has the same recent experiences, and not everyone has the same thoughts and emotions about a given change. This difference between personal perspectives explains why change for an individual is one thing, and why crafting a change across a group, whether of three or three hundred, is much more challenging. Each individual within the group is in a different place mentally and emotionally about the change. So think about this: as a new leader, you need to manage, lead, and somehow get everyone on board to make a change really happen. . . . The good news is that there are tools, strategies, and actions you can take that will make all of this complexity less confusing and more doable. At the same time, this complexity is real and must be noted. That simplification is the goal of the rest of Part Two: Change–to help you understand and navigate changes both for yourself and as a leader of others. 1. If you didn’t do the exercise at the start of this chapter, do it now. The self-awareness that comes to you about how you feel about change is valuable. 2. If you didn’t include your promotion as one of your changes, make sure to list the words you think and feel about this change, too (perhaps making it a separate list for the sake of comparison). 3. Buy a cup of coffee for your new boss or someone else you know who has been in a leadership role for a while and talk with this person about her experience and the lessons she learned when she transitioned to leadership. 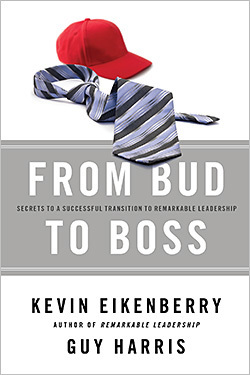 Reprinted by permission of the publisher, John Wiley & Sons, Inc., from From Bud to Boss: Secrets to a Successful Transition to Remarkable Leadership by Kevin Eikenberry and Guy Harris. Copyright (c) 2010 by John Wiley & Sons, Inc. All rights reserved.